The political and economic health of countries are key measures of the welfare of nations. A country that fails its citizens politically and economically can make little claim to legitimacy. In articles such as Canadian political calculus: Zero-sum or win-win? and An idiot's persistence: Asinine adventures of the Harper Conservatives I have pointed out deficits in regard to both of these key areas of the public sphere. Yet, immersed in politics and economics it is easy to lose sight of the objectives of both, namely to serve the interests of citizens, providing them with health, happiness, and well-being. These might sound like Utopian objectives we should eschew in favour of more concrete and tangible goals like per capita income and Gross Domestic Product (GDP). However, if we cleave solely to these we have succumbed to the materials ethos of our times. This path is littered with the corpses of consumer goods, marketing, advertising, the maniacal pursuit of wealth, and the most omnipotent capitalist demon of them all -- the one-eyed ogre called "television." In fact, determining well-being, while of necessity involving some subjective factors (happiness and well-being being subjective phenomena) is far from being an amorphous discipline. They can be quantified and measured like many other phenomena and their analysis can yield important insights about the effectiveness of governments in translating their economic and political agendas into concrete measures that benefit their citizens -- or not. A comparison between different nations allows us to determine how well Canada's government is performing and where there is scope for improvement. While many approaches are possible, I've chosen to examine five main measures, each of which provides certain insights into health, happiness, and well being: 1) life expectancy; 2) poverty; 3) life satisfaction; 4) educational performance; and 5) childhood well-being. 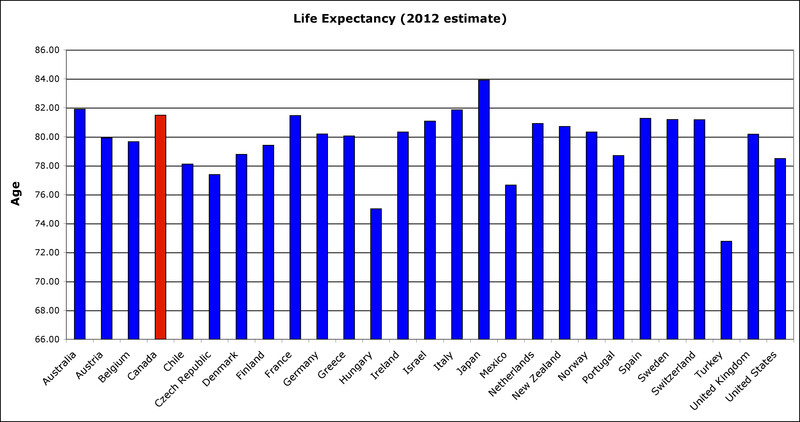 Canada fares very well in regard to life expectancy. Of 221 countries listed by the 2009 CIA Factbook, Canada ranks twelfth overall with a mean life expectancy of 81.48 years. Amongst the OECD (Organization for Economic Cooperation and Development) countries only Japan (83.91), Australia (81.90), and Italy (81.86) rank better, although as the figure below indicates, many other countries are closely clustered with France, Spain, Sweden, Switzerland, Israel, Iceland, Netherlands, New Zealand, Ireland, Norway, Germany, United Kingdom, and Greece all having life expectancies in excess of 80 years. Life expectancy in the United States, in comparison, is 78.49 years. Access to good quality healthcare, improvements in medicine in relation to diseases of aging such as heart disease and cancer, improved diet, and clean water have all been cited as factors responsible for Canada's good standing. Canadian life expectancy has increased dramatically over the past century from a mean of 60 years in 1920 to the present 81.48. There are differences of opinion in terms of what constitutes poverty and what metrics should be used to measure it. The OECD provides three poverty thresholds: people living at less than 40 per cent, less than 50 per cent, and less than 60 per cent of the current median income level; and the poverty rate before taxes and transfers have been included and after. The figure below employs the percentage of people living at less than 50 per cent (the intermediate value) of the current median income levels of each country, and after taxes and transfers. 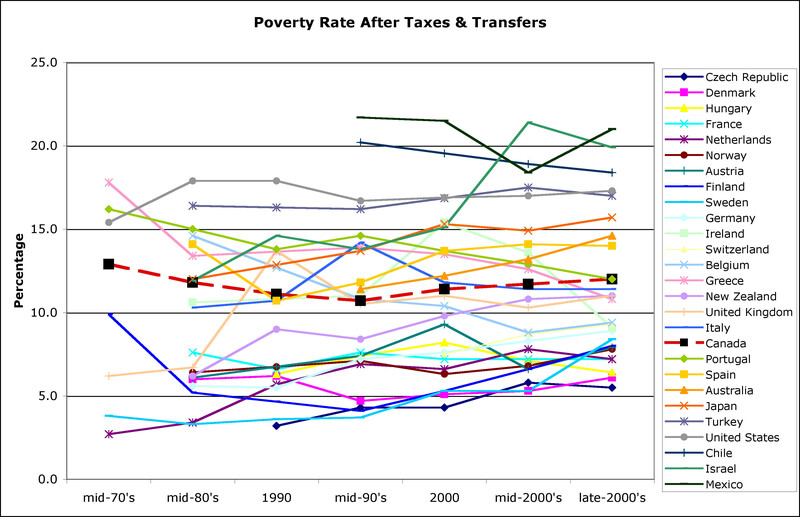 It represents the poverty rate in OECD countries as it has changed from the mid 1970's until the late 2000's. Although the result may look like a bowl of multi-colored spaghetti, it's not difficult to interpret. The dashed red line with the large black squares shows the Canadian poverty level, which has changed rather little over the past 35 years from 12.9 per cent in the mid 1970's to 12 per cent in the late 2000's. Although Canada falls in the middle of the range of values, it actually ranks 18th in the OECD, well behind the Czech Republic, Denmark, Hungary, France, Netherlands, Norway, Austria, Finland, Sweden, Germany, Ireland, Switzerland, and Belgium, all of which have poverty rates in the single digits. A number of features of Canadian society such as healthcare, universal free access to primary and secondary education, Canada's progressive income tax, minimum wage laws, child tax benefits, and social programs such as welfare, old age security, and employment insurance have been cited as factors in helping to address poverty and alleviate some of its detrimental features. Canada's ranking in relation to other OECD countries, and the very modest improvement in poverty levels over the past third of a century, indicate that considerable further progress in this area is possible -- if there is the social and political will to address the issue. This metric is to be contrasted with the "basic needs poverty rate", a politically-infused measure concoccted by the ultra-conservative Fraser Institute, which has tried to make poverty evaporate. The Fraser Institute's index shows the poverty rate as declining from 12 per cent to less than 5 per cent over this same time period. By tampering with the measuring tape they are attempting to define Canadian poverty out of existence -- cold comfort to those who are struggling to attain better living conditions. "What is notable is the combination of relatively standard economic measurements such as household income and education with measures of cultural integrity (e.g., the use of dialects, engagement in traditional sports and community festivals), ecology (e.g., forest cover), health status (e.g., body mass index, number of healthy days per month), community well being (e.g., social trust, kinship density), time allocation and general mental health (e.g., indicators of psychological distress." 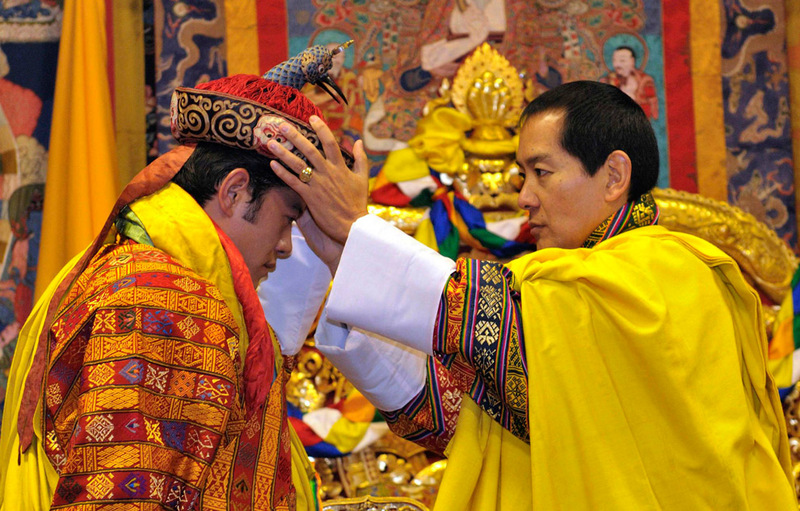 Although to some degree culturally specific, GNH nonetheless lays the empirical groundwork for a way measuring how well the policies and conduct of a nation translate into actual health, happiness, and well-being for its citizens. Although Gross National Happiness has not yet been widely enough to provide international comparisons, Gallup has developed indices of well-being that measure the behavioral economics of GDP growth as manifested in the lives of individuals. The figures below represent the results of two of these. 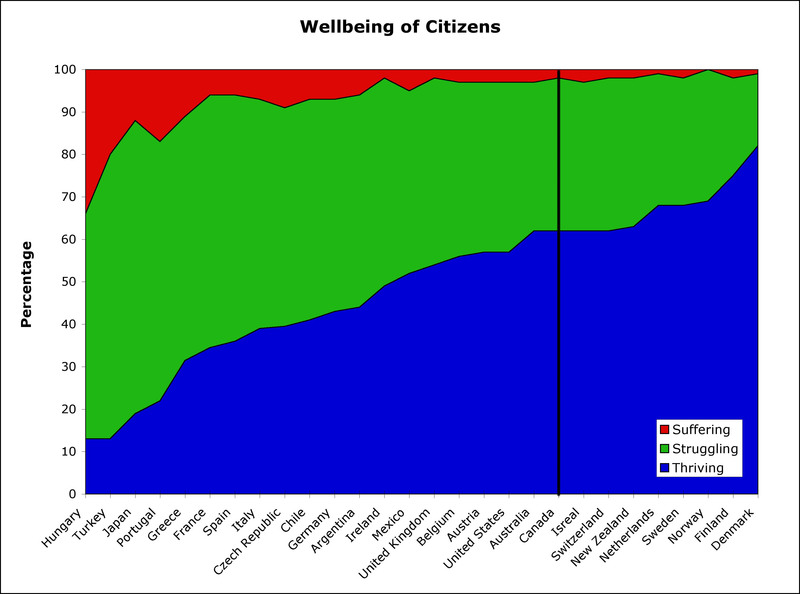 The first shows the proportion of people who are thriving, struggling, and suffering in OECD nations. It is based on a self-evaluative scale where people rate their present and perceived future lives on a scale from "0" (worst) to "10" (best). Those who rate their current lives a "7" or higher and their future an "8" or higher are considered thriving. Individuals are suffering if they report their current and future lives as a "4" or lower. All others are considered struggling. Canada (indicated by the dark line) ranks ninth amongst OECD nations on this evaluative scale behind Denmark, Finland, Norway, Sweden, Netherlands, New Zealand, Switzerland, and Israel. It's a respectable position, but we still have some distance to go to approach the level of well-being achieved in the Scandinavian nations. 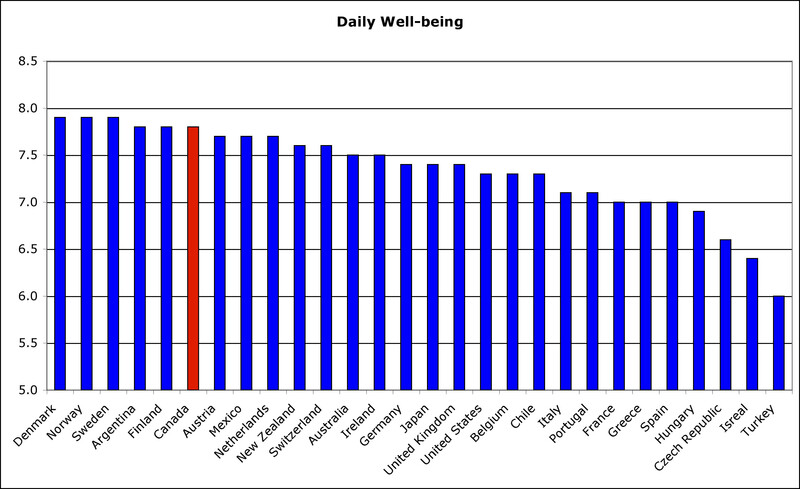 A second index, of daily well-being, has also been developed by Gallup. Again, based on a scale from "0" (worst) to "10" (best) it asks respondents to rate their daily experiences of well-being (i.e., feeling well-rested, being treated with respect, smiling/laughter, learning/interest, enjoyment, physical pain, worry, sadness, stress, and anger). Canada ranks sixth amongst OECD nations on this evaluative scale behind Denmark, Norway, Sweden, Argentina, and Finland, another striking illustration of the quality of life that has been achieved by the social democratic approach of the Scandinavian nations. Although countries such as Germany (7.4), Japan (7.4), and the United States (7.3) are economic powerhouses, they trail the Scandinavian nations, Canada, and Argentina (7.9-7.8) in this metric. Another important metric of societies is how well students perform in mastering educational objectives. The OECD has devised the Program for International Student Assessment (PISA) that involves a series of tests that assess the reading, mathematics, and science knowledge of students and is administered in over 70 countries to 15-year-old students. The figure below shows the results for OECD countries. 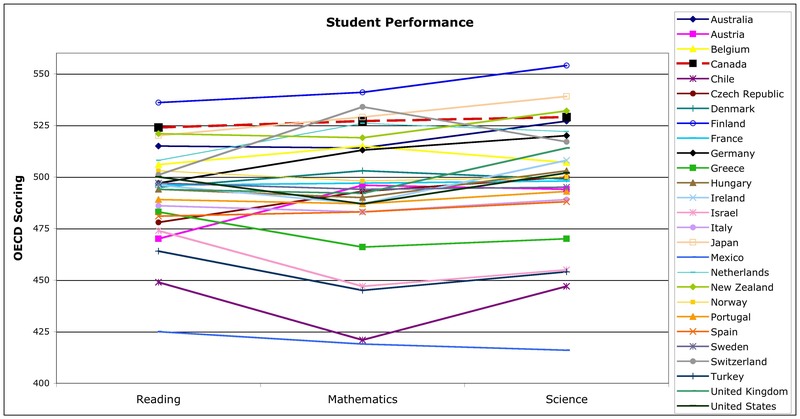 The dashed red line with the large black squares shows the Canadian results for these three key educational touchstones. Overall Canada ranks very well, sixth amongst the 70 countries behind China, Korea, Finland, Hong Kong, and Singapore. Amongst OECD countries, only Finland (overall), Switzerland and Japan (on Mathematics), and Japan and New Zealand (on Science) rank better than Canadian students. It seems clear that the Canadian primary and secondary educational systems are serving Canadian students very well with outcomes exceeded only (in the main) by some of the nations of the Far East and Finland. 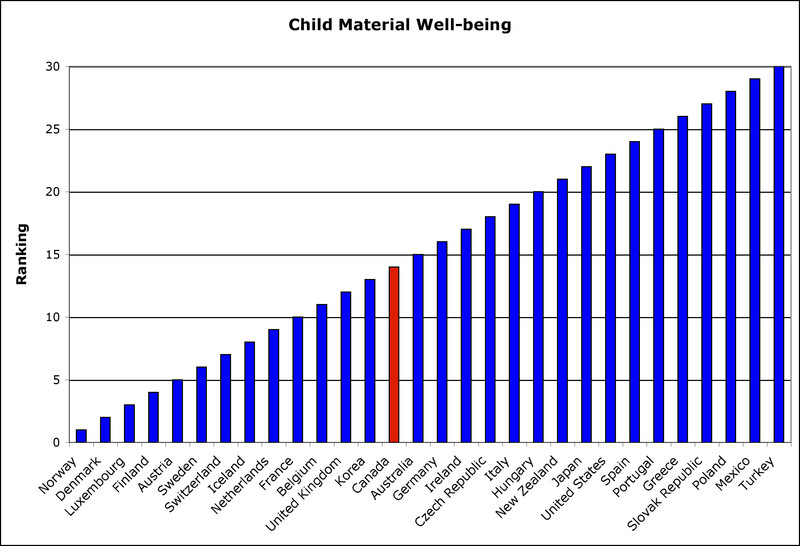 The well-being of children can be measured through a variety of metrics developed by the OECD, namely 1) Material well-being; 2) Housing and environment; 3) Educational well-being; 4) Health and safety; 5) Risky behaviors; and 6) Quality of school life. I won't go into the details of how these are calculated, but the figures below show the results of five of these indices (Housing and environment are not shown since data in this area was not available from Canada) in rank order for OECD countries (so, the lowest rank order, i.e., the first, is the best). 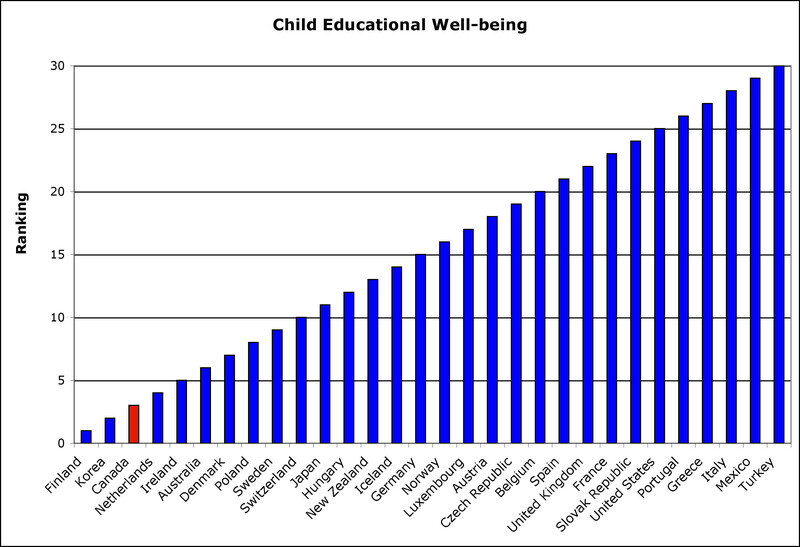 Canada excels at the educational well-being of children, and ranks third in this compilation behind Finland and Korea. Three indicators (the PISA country scores; the comparative inequality of these scores using the ratio of the 90th to the 10th percentiles averaged across three PISA literary measures; and proportions of 15-19 year olds not in education, employment, or training (NEET)) are used in calculating this metric. 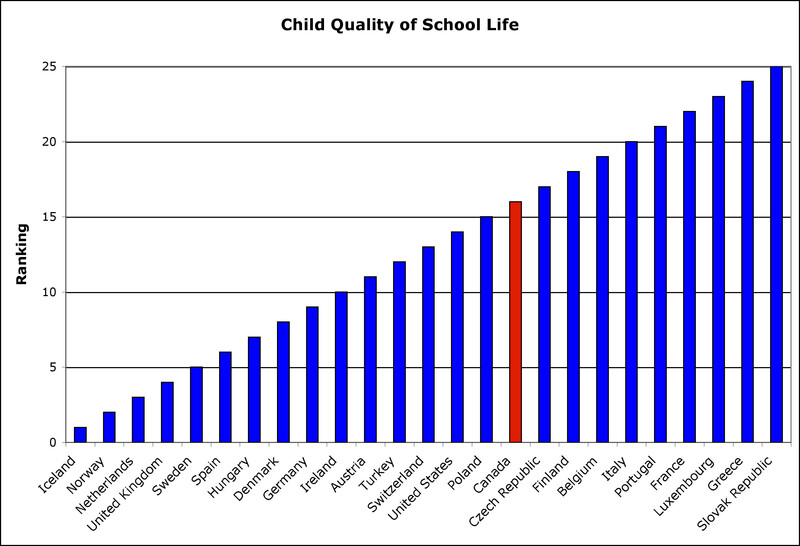 In terms of the quality of school life, Canada does not fare quite as well, falling 16th out of the 25 OECD nations for which there was available data, trailing Iceland, Norway, Netherlands, United Kingdom, Sweden, Spain, Hungary, Denmark, Germany, Ireland, Austria, Turkey, Switzerland, United States, and Poland. This metric is a combination of experiences of bullying and overall subjective satisfaction with school life. Although our primary and secondary educational systems are doing a good job educating children, the social environment in which this takes place appears to be less than optimal. In Canada 22 per cent of children report having been bullied, a slight increase of 2 per cent from 2002. With respect to material well-being, three measures are used to determine this index: disposable income in families with children under age 18; the poverty rate for children; and the proportion of 15-year olds deprived of the basic necessities for education relevant to student performance. Canada ranks fourteenth out of the thirty OECD countries behind Norway, Denmark, Luxembourg, Finland, Austria, Sweden, Switzerland, Ireland, Netherlands France, Belgium, United Kingdom, and Korea (in that order). The Conference Board of Canada calculates that 15.1 per cent of Canadian children live in poverty (employing the OECD definition above). In determining the index of child health and safety, eight indicators are used: infant mortality, low birth weight, immunization for whooping cough and measles, physical activity of children aged 11-15, and mortality rate for children (aged 1-19) by all causes and through suicide. This is a complex metric and Canada ranks rather poorly in this area compared to its fellow OECD members, falling 23rd of 30 ahead of only Ireland, Belgium, United States, Austria, Mexico, New Zealand, and Turkey. Parameters like infant mortality have been falling in Canada (from 5.4 per 1,000 in 2005 to 4.9 per thousand in 2009), although low-infant birth weight has risen from 5.5 per cent in 2000 to 6 per cent in 2007. Although rates of youth suicide have declined in Canada since the 1980's (now approaching the general population's suicide rate of 13 per 100,000) they are still the second highest cause of death in this demographic after motor vehicle accidents. Finally, the OECD also examines risky behaviors amongst children, compiling a metric composed of indices of 15-year-olds who smoke regularly, 13- and 15-year-olds who have been drunk on more than two occasions, and the rate of female teenage (15-19 years) motherhood. On this measure Canada scores tenth out of 30 OECD nations behind Sweden, Japan, Korea, Norway, Switzerland, Portugal, Greece, Iceland, and the Netherlands. While drunkenness amongst 13-15-year olds is generally more prevalent in boys, Canada is one of handful of nations where rate of girls being drunk exceeds that of boys. There have been significant strides in relation to teen pregnancy and abortion with Canada now having one of the lowest rates (27.9 per 1,000 women aged 15-19) in the world, a 36.9 per cent decline in the decade between 1996 and 2006. In Canada, only 2 per cent of youth in grades 6-9 smoke whereas 10 per cent of youth in grades 10-12 do so. Both have exhibited significant decreases in recent years, the former being at its lowest level since 1994. It is clear that in some areas Canadian policy has served its citizens well. The primary and secondary education system is delivering excellent educational outcomes. However, high tuition costs and spiraling student debt at the post-secondary level are stumbling blocks in translating this education to the lives of citizens and the welfare of the economy (see Escalator to the bottom: Quebec students refuse the ride). In terms of the poverty rate, Canada ranks 18th of 30 OECD countries and over the past third of a century has made almost no progress in addressing the consistently high rate of its citizens who survive on less than half of the median income. Life expectancy in Canada is good and has improved over the past century, largely as a result of public health care, advances in medicine, improved diet, and clean water. 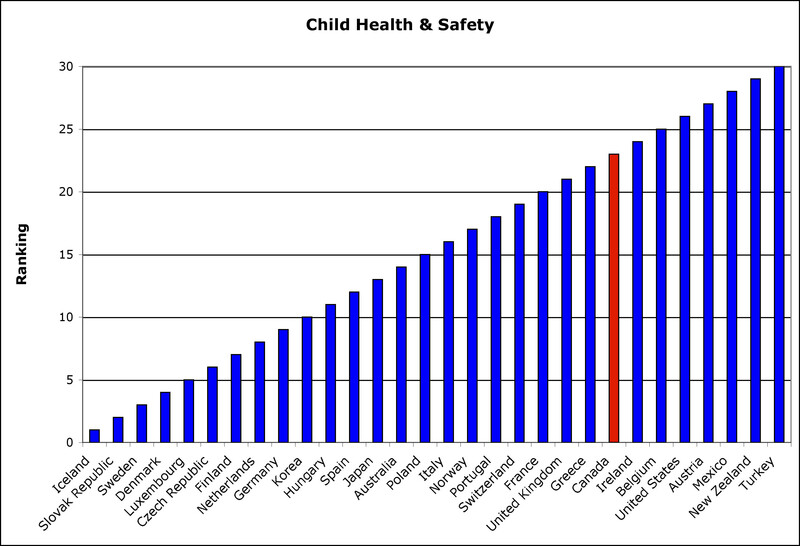 In non-educational areas of childhood well-being, Canada has a mixed record, scoring poorly on material well-being (a.k.a., childhood poverty) and child health and safety; somewhat better in terms of risky behaviors. We provide our children with a good education but other social determinants of a healthy and rewarding childhood are in need of improvement. Finally, in terms of the overarching metric of "life satisfaction" Canada delivers a respectable quality of well-being to its citizens, but a number of nations -- notably the Scandinavian countries -- do significantly better. Prime Minister Stephen Harper never tires of boasting about the economic performance of Canada. At the International Economic Forum of the Americas on June 11, 2012 Harper said, "The Canadian approach is what the world needs. A practical approach, an approach that works. Canada can demonstrate, through our actions, a model that works." An evaluation of Canada's past economic performance and future economic prospects is the subject of a separate inquiry, however, an appraisal of its social progress as manifested through the well-being of its citizens demonstrates a more complex picture. There are indeed areas where Canada can offer examples to the world, and other domains where Canada could do well to learn from what has been done in other countries.